As I have mentioned on numerous posts the Monkey has extreme anxiety. He needs to know everything that is happening at every second of the day to allow him to function. To do this we used visual strips and schedules for literally every little thing you can think of but this worked really well. It was time consuming in the beginning but once I had all my pictures taken, everything laminated, and velcro added it made life in our house much more enjoyable. 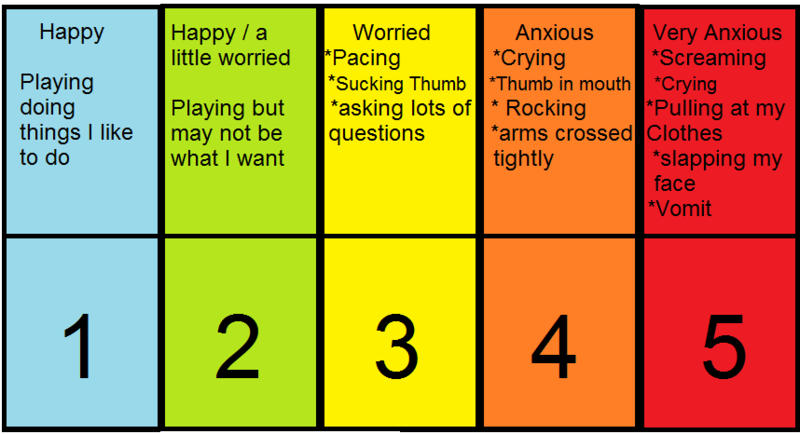 Now that the Monkey is 5 and visual strips were working really well for the most part I decided that I wanted to focus on teaching him how to recognize when he is being anxious and vocalize what this meant. His workers were originally on the path of facing fears meaning in hearing the Monkey had a very intense fear of puppets which lead to meltdowns whenever they came on TV they wanted to break the fear. My stance on this was very different as I did not care that he was afraid of puppets. This fear may not make sense to you or I but I am afraid of spiders and this is no different. What I want him to be able to do is instead of running away and screaming when puppets come on tv or shutting down when he sees a picture of a puppet is I wanted him to learn to vocalize his fears and understand what he is feeling. My reasoning for this is when he starts school if there is something making him anxious he will be able to tell his EA or his teacher how he is feeling and why he is feeling this way so that they can actually help resolve the issue. My approach will give him the strategies to teach him how to face fears he has now and fears he develops down the road. Once I explained this to his Senior workers they completely understood what I meant and they were 100% on board with this. The asked me to write the monkey a social story outlining his fears with strategies that he can use when he starts feeling this way. 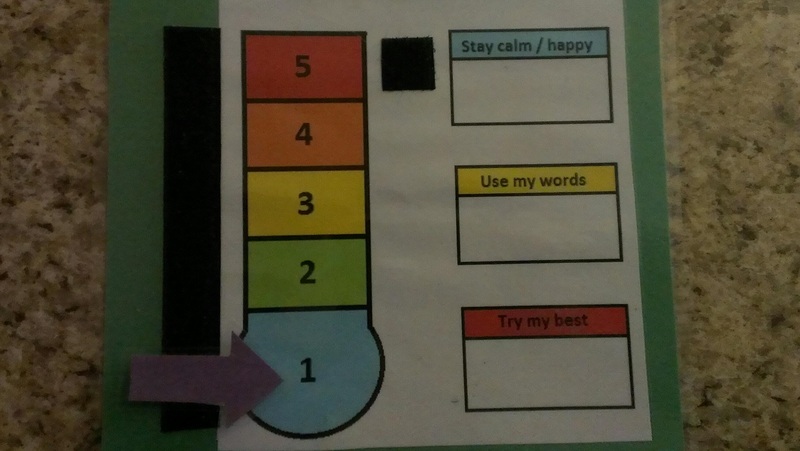 We used a 5 point scale system which was colour coded. Each number had an explanation of what he might be physically feeling or displaying when at this number. I then used images of him in each scenario so that he had a visual queue of what these things meant. Then I broke it down further explaining what he can do when he is in the not so happy numbers. Once we read the social story with him each day so that he understood what the numbers meant and what he can do we used a visual thermometer with the numbers and the colours on it . In the beginning we all practiced this in theory meaning when he was perfectly calm we would say, “Ok the Monkey is at a 3 right now what can we do to calm down?” He would then have to tell us one of the things he can do to calm down and then he would get a sticker on his reward train for this. Once he was able to tell everyone what he can do when he is at a certain number it was time to do this in real life meaning when the Monkey was in meltdown mode he needed to vocalize how he was feeling and what he can do to calm himself. At first we would be the ones saying I think the Monkey is at a 3 right now lets do a strategy. It would be up to him however to tell us which strategy he wanted to use. In the beginning when we first started to use this method it did seem to cause more meltdowns or increase his meltdowns so I was a little doubtful that this would work. Now a few months after implementing this system he is able to tell you he is at a 3 and he will ask you to do one of his strategies with him. 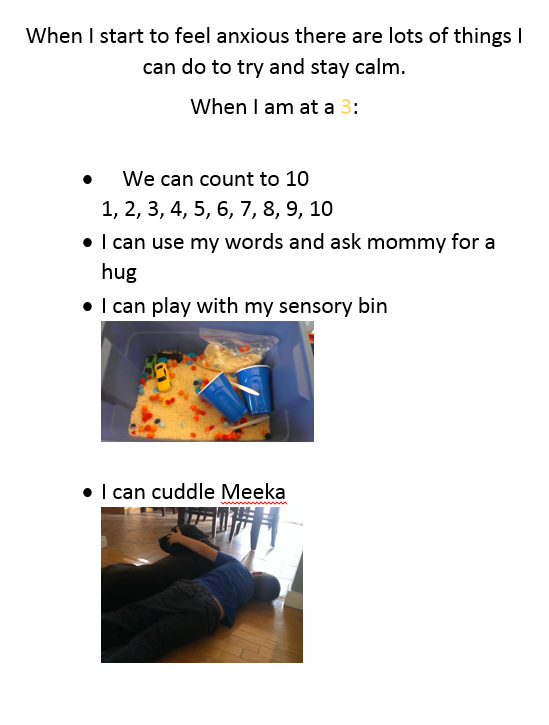 Counting and a hug seem to be his preferred methods of calming himself and so he can engage us in doing this with him. I’m amazed really at how well this is actually working but I am so glad that it is. It is however a work in progress as the Monkey can not calm himself once he has gone past a 4 or 5. So if something has upset him to the point that he has gone straight from 1 – 5 then he completely shuts down and we simply have to wait it out. 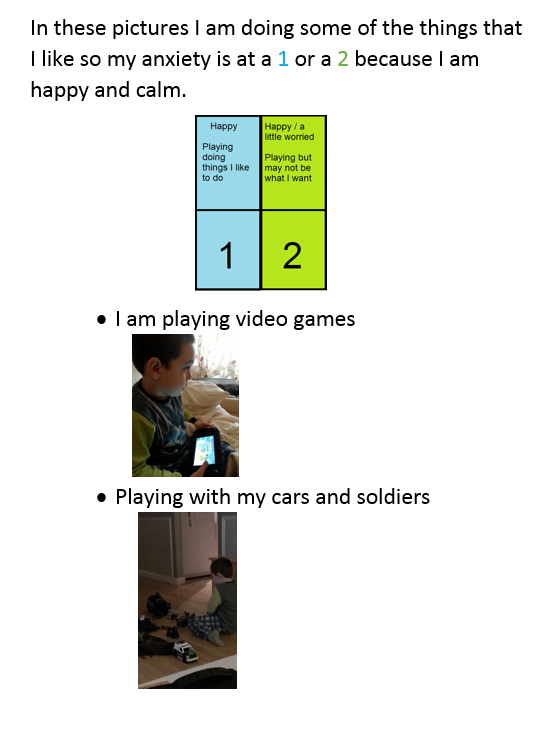 I am hoping as he matures emotionally that he will someday be able to recognize and calm himself at these points as well but right now the system is helping with the little meltdowns we were having daily and that is fantastic. If I only have to deal with one or two major meltdowns a week and the little ones that used to turn into major ones are now calmed by the Monkey himself I can be nothing but proud of this progress. This is a system I would definitely recommend to anyone who has a child with high anxiety. Teaching them how to recognize how they are feeling is vital. If you don’t understand how you are feeling when faced with a trigger then how can you learn to cope with the trigger itself. Picture this: You are trapped in a room filled with snakes. The sound of their hissing becomes deafening as anxiety and panic takes over every sense that you have. You swear that they are touching you and you feel like your skin is crawling. Now imagine you can not tell anyone what you feel or that you are scared because you do not understand what this means. You try to run but there is no where to go so you fall to your knees in to a ball your hands covering your ears and all you can do is scream and pray it will go away. People stare at you but because they are not afraid they do not understand what is wrong all they see is you screaming in a corner. How do they approach? What should they say? Now if you could have said, I feel anxious right now I don’t like snakes can you help me leave the room or can you help me calm down then may be they could have helped you. My goal is not to no longer make him afraid but to give him the ability to tell people what he is afraid of so that they can possibly understand how to help him.